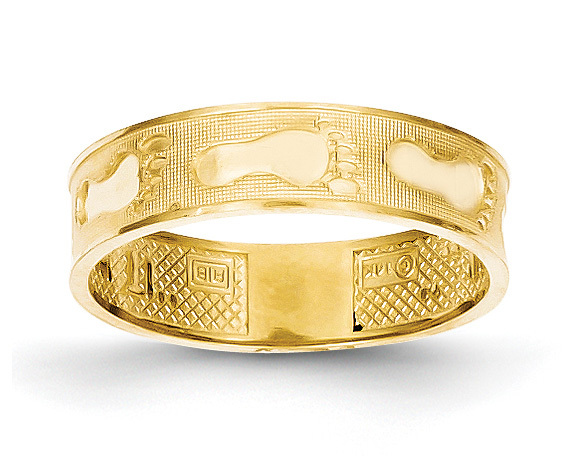 A 14k solid gold footprints band ring for women, from Apples of Gold Jewelry. Made with a textured surface and polished footprints embossed onto the gold band. The band measures 5mm wide and is available in women's sizes 4-8, including half sizes. The band has a small sizing space at bottom for later sizing if needed. The ring weighs a total of approx. 2.39 grams of 14k solid gold! Our footprints ring is made in the U.S.A.! We guarantee our 14K Gold Footprints Band Ring to be high quality, authentic jewelry, as described above.